The Hutchins School is an Anglican day and boarding school for boys from pre-kindergarten to Year 12. Established in 1846, Hutchins is one of the oldest continually operating schools in Australia. 0700: Another radio interview this morning – a bit closer to home: talking with Ryk Goddard on ABC Hobart. I think he was quite pleased to hear that we’d had bad weather, but he was genuinely interested in the marine debris survey. Both teams headed to shore about 8:30 to assemble for our group photo. After the photo, the marine debris team departed for the Iron Joy and steamed away for Cairns, leaving us alone out here. 0945: Another Skype session back to Hutchins, today with Richard Gard’s Year 8 Science class. They had been studying adaptations in their lessons and had also sent me in a list of questions about the animals and plants we’ve been finding. Nik, Ryan and Barbara all discussed their various groups of animals, the kinds of adaptations that they have for their existence out on these isolated islands and how they got here. Ryan explained that geckos have incredibly sticky eggs which can be laid in cracks in logs or other vegetation which will float out to the islands. Furthermore, one of the species that we found is all female, reproducing through parthenogenesis so that each daughter is an exact copy of their mother – a clone. For the spiders there’s a different story. The baby spiders ‘parachute’ on silken threads, travelling up to great heights in the atmosphere and going great distances. 1200: After lunch we steamed over the 40 minutes or so to South West Herald Cay. The weather has turned really nice, with calm seas and blazing sunshine. The Odyssey anchors right next to the reef and everybody decides to have a snorkel – some for work, the others to see the reef. There are quite a few things on the reef that I was expecting to see but haven’t up until now including sea urchins, an anemone with clownfish and sea cucumbers. Despite the beautifully clear water there aren’t as many corals as I thought there might be. Merrick and Andrew speculate that Cyclone Yasi probably ripped through here and destroyed a lot a coral – most of the colonies are quite small and probably only a few years old. The fish life is varied with lots of different butterflyfish, triggerfish, damselfish and schools of parrotfish grazing on the reef. 1500: Set up for another Skype call, this time with my pre-tertiary Biology class. It was great to see all of the students even if the connection wasn’t the best at times. Andrew and Merrick showed them some of the material they have been collecting and explained the biogeography of these Coral Sea islands. Despite the technological difficulties it is amazing to be able to communicate in real time from such a distance away from the classroom. After the call, a group of us head over to the cay to do some more collections. Andrew is busy lifting up beach rock slabs to look for various crabs – porcelain crabs, shore crabs and hermit crabs – while Barbara is excited to find crab spiders, a new group for her. Ryan and Nik have found some different species as well as some praying mantis nymphs so we’re still finding new things in each place. 0600: North East Herald Cay. Up early this morning so that Shellie and I can head over to see how the CSIRO random marine debris survey is done. Rather than the full collection method of the Tangaroa Blue survey, the CSIRO method uses random transects perpendicular to the shore and scores the debris by type, colour and size. So we have an early breakfast and head off in the drizzle to the island. We pair up with the scientists and start our survey. Unfortunately, the rain gets heavier and soon we’re soaked and, even though we’re writing on waterproof paper, recording the data gets quite difficult. 0900: I return to the boat to do a radio interview with ABC Far North on the satellite phone. I have a nice chat with Phil, the radio host, and we discuss the aims, discoveries and challenges of the trip. In the meantime, all of the bug people – Nik, Ryan and Andreas – are busy working through their samples from Coringa which they hadn’t had the chance to process. 1200: We head in to shore so that Shellie can do her first Skype sessions with his classes in Victoria, both of us being unable to Skype on Monday. After a few technical issues, she manages to get through and talk to her Year 10s. 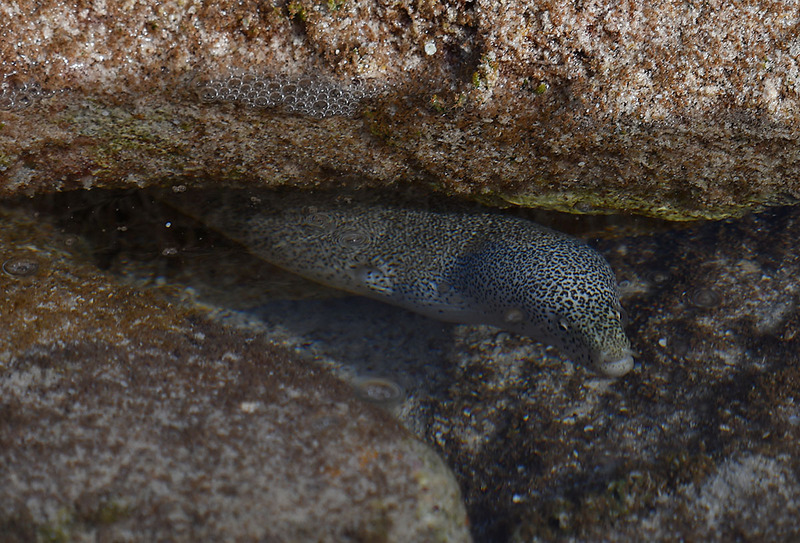 In the meantime, all of the invertebrate people have started their collections on the island, while Andrew and Merrick are searching the rock pools at low tide. At this stage in the trip everyone knows what they have to do and are very efficient at just getting on with it. 1430: We are dropped over on the Iron Joy so that we can do a plankton tow for bits of very small plastic floating in the ocean. As with the beach survey, this is a standardised CSIRO method which has been conducted all over Australia and so can give the full picture of what’s happening. The small plankton tow is lowered over the side for 15 minutes and this is repeated three times. As well as the small pieces of plastic the tow brings up…surprise, surprise plankton! Everything out here seems to be blue or purple (presumably as camouflage). We find a couple of species of fish larvae, a small purple medusa jellyfish, lots of blue copepods and various jellies. One interesting thing is a little by-the-wind-sailor, a type of jellyfish that uses a ‘sail’ to drift along in the ocean currents. 2000: After dinner, I headed over to the cay to see what the night work entails. Andreas had already set up his light trap. We took him dinner which he enjoyed. The light trap has a high energy mercury vapour lamp which puts out a lot of UV radiation and therefore attracts lots of insects. It also means that the people working around the light have to wear sunscreen, hats and long-sleeve shirts to avoid getting burnt! Unfortunately, the wind can play havoc with collecting smaller moths as the sheet billows and flicks them off. Andreas is always very careful to try and find a protected spot but it’s difficult on these islands where there is very little protection. Even at night the birds are still flying around, squawking and squabbling. 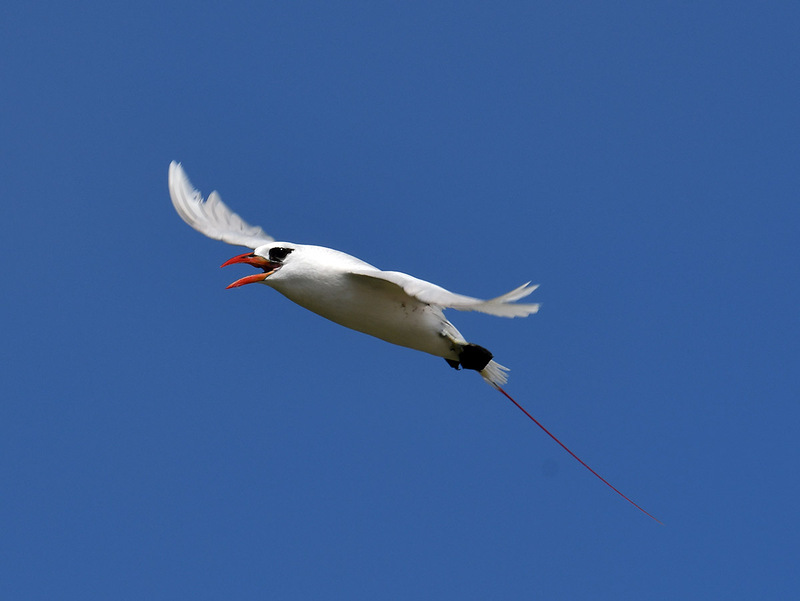 On NE Herald, there are a lot more red-tailed tropic birds than we have seen up until now. They nest everywhere – under rock slabs, in little depressions under bushes – and when you’re walking around you’ll often here an outraged ‘squaark’ when you get too close. They are beautiful birds with two long red ‘streamers’. Who is this hairy, long-legged beast? 0700: Well, the weather has sprung another surprise on us. Rather than the calm conditions that were predicted earlier in the week, the wind veered 180° so we had to move around to the other side of the island. Then, during the night a big rain squall came in, surprising those on the boat who had left their windows open and soaking the campers on land. Then, one of the links on the anchor chain started to break, clanking on the hull and requiring urgent repair. The wind continued to strengthen making it quite rough even on the anchorage. The main issue vexing the crew was how to get the shore crew back aboard as the waves were really crashing on the islet. Jimmy, the valiant Tasmanian deckie, swam ashore with some breakfast for the islanders and to reassure them that we wouldn’t leave them stranded! After some discussion the crew decided they could get the scientists and the gear off although it was going to require swimming to get on board the boat as it was going to be too dangerous to do a transfer in the swell. So, suitably geared up in wetsuits, four of the crew sped off to the shore. Back at the boat the crew had floated a life ring off the back of the boat. The tender manoeuvred close to the ring and the scientists jumped overboard, grabbed the ring and were pulled on board. Then the gear, including a generator, was loaded into a sling bag and retrieved using the winch. The original plan was to go to Chilcott Islet, another one of the Coringa islets, but, as the weather was still worsening (and the crew had declared the present anchorage as the worst in the Coral Sea! ), we decided to head to North East Herald Cay where we could be guaranteed a secure anchorage. So we steamed for 6 hours in rough seas while everyone basically tried to find somewhere to not feel seasick/catch up on sleep/read a book depending on the level of tolerance of the movement of the boat. So, no new creatures to identify but I’ll post up an animal that we’ve see quite a lot of – hopefully fairly easy to identify. What is this colourful character and what is it doing? 0700: Arrived on station at Coringa Islet just after dawn to rendezvous with the Iron Joy. Weather quite a bit rougher than when we arrived at East Diamond Islet so we spent a while motoring around to get into the right position so we could drop the anchor and not be too close to the other ship. 0900: It’s going to be a marine debris day! We landed on shore in one of the Iron Joy’s tenders – a little inflatable – because the waves were reasonably substantial and it would have been very tricky in our bigger tenders. We wrapped everything up in dry bags as it was wet getting to shore. Met up with the other expeditioners for the first time – a mix of people from non-governmental organisations (Tangaroa Blue, Surfrider Foundation and Take 3), Parks Australia and CSIRO. We introduced ourselves and caught up on the different parts of the voyage – mainly exchanging sea-sickness stories! 0930: We are briefed on the marine debris collection and issued with a large sack and gloves. We set off around the island, picking up everything that we can find which includes discarded fishing gear, plastic bottles, thongs and lots of miscellaneous bits of plastic. Halfway around the island we come across a huge pile of discarded rope half buried into the sand. These bits of rope are quite common and require a big effort to dig up and remove. This particular pile was the biggest that the marine debris team have come across in this trip. We had to cut up the rope with a hacksaw in order to untangle it and make it possible to get it all out of the sand. After getting the rope up we carried it around the beach to a place where the tenders could get ashore to pick it up. It required a lot of people to transport it – in total there was 72m of rope weighing a total of about 375kg. Matt from Tangaroa Blue explained that when the ropes start to wear out, the ships just chuck them overboard. This is illegal (they’re supposed to take them back to land for disposal), but obviously very difficult to police. Empty aluminium phosphide container. If you ever see one of these with its stopper still in, do not open!! We learn a lot more about what makes up the majority of marine debris. So far this trip the marine debris team have collected about 1.5 tonnes (they’re actually starting to run out of space on the Iron Joy). There is a lot of discarded fishing gear – ropes, nets and floats. Fish attracting devices (FADs) made from old, worn-out netting or other material are a big contributor. Of the material coming from land, the majority is plastic. Tangaroa Blue records more than 170 different categories of marine debris in their database. As usual, the material we sort through contains lots of plastic bottles which are separated out for recycling. There are lots of rubber items and foam insulation of various kinds. Matt tells us about some of the more unusual items he’s found including a prosthetic leg attachment and false teeth. 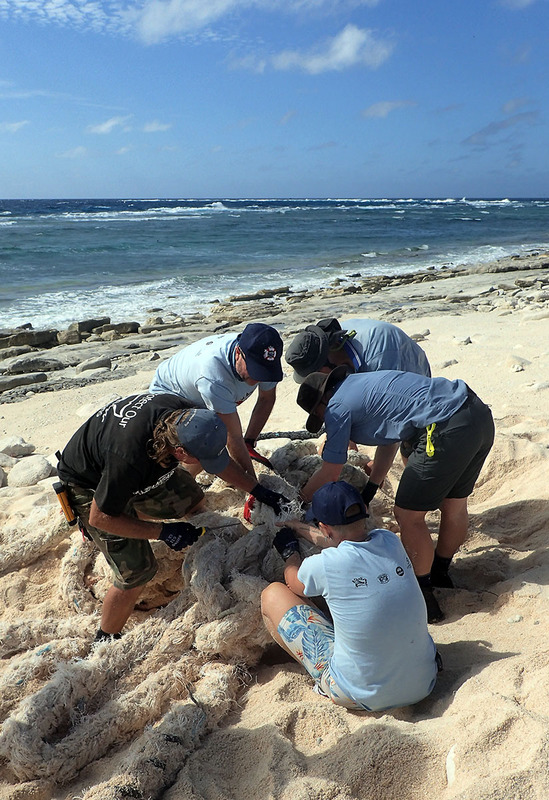 While cleaning up the debris is important, the three NGOs are also trying to reduce the problem at source by ensuring that the plastic doesn’t get into the marine environment in the first place. 0700: Woke up to find another boat had arrived in the night – the AMSA vessel Coral Knight. They were here to service the automatic light on the island. Apparently the boat services all of the facilities from the Torres Strait down to the southern Great Barrier Reef – an interesting job, I imagine. At breakfast time the overnight crew returned from the islet. They had had an interesting night on the islet but a bit too windy for the light trap to work as efficiently as they would have liked. After breakfast they went back to pack up the traps and bring the specimens to the boat for sorting out of the wind. It is important to separate, prepare and preserve the specimens so that they can be identified properly back at the various museums and universities. I stayed on board for the rest of the morning to learn more about the preparation and identification of the insects that had been collected. Andreas had the most laborious job. After the moths have been caught and killed, they need to be pinned out so that the wing patterns can be compared with individuals in collections, which tells us whether they might be new species. For the larger moths it’s not too difficult but with the smaller ‘micromoths’ a lot of precision and manual dexterity is required. Andreas told me that the tiny insect pins can pose a real problem if they get flicked out of the dish because it’s quite easy to sit on them or get one in a finger and it can require surgery to remove them. Not something I considered as a risk in moth collecting! 1300: Everyone reconvenes on board for lunch before deciding what we’re doing for the afternoon. The insect people are doing a last collection, but I’ve decided to go off with Merrick and Andrew to see what the snorkelling has to offer. We’re going to check out some of the more isolated bommies on the northwest side of the island. The snorkelling is fantastic – clear water with lots of life of all kinds. I’m fascinated by how much competition there is for space on the reef. There is no bare space at all…corals, soft corals, algae and other cover the substrate. It’s a real battleground out there, it just happens a lot more slowly than we can normally observe. Merrick and Andrew are busy collecting material. As they duck dive down, I observe how closely they have to look to find their particular species of interest. After circumnavigating the bommie, we signal to Karl to pick us up in the tender – he has been attentively following us to make sure we’re safe. Karl, one of the crew, is a Tasmanian from Woodbridge. We both agree what a great place Tassie is to live, but we’re also grateful to have the warm weather of the tropics. We head off to another area – this one is a bit too deep to get down to on snorkel and there are a few reef sharks checking us out so we move on. We head over the to the lagoon behind the reef crest which runs northwest from the tip of the island. This is a really nice snorkel: we just let the current from the incoming tide carry us along while we stop and observe when we see something interesting. It’s quite shallow, only a couple of metres at the beginning, which makes it easy to duck down and have a look at anything that catches the eye. What amazes me is the large number of huge spider conches just lying on the sand. They’re not so easy to spot from above as their shell is covered with algae so that it looks like a bit of rubble. However, turn them over and there is this beautiful orange-brown shiny interior with just an eye and a bit of foot poking out (which is usually quickly retracted!). 1700: Back to boat to pack up for tonight’s steam to Coringa Islets which should take 9-10 hours. We’ll meet up with the Iron Joy there which will mean we’ll catch up with what has been happening with the marine debris clean-up. The weather has been getting better all the time so we’re promised a smoother crossing than that of two days ago, much to everyone’s relief. It means that we can enjoy Harry’s ginger infused pork belly without worrying about the consequences! As I’ve been snorkelling today, I felt that the daily challenge should reflect one of the rarer animals that I saw today. Generally abundant on reefs, I’ve only seen one individual in my time here. What is this many-armed creature? 0600: Wow – woke up to see flat calm waters and a long thin sand cay out of the window. We’ve arrived at East Diamond Islet, our first stop on this Coral Sea Bush Blitz. Everyone very happy and excited by two things: the chance to get ashore at our first destination and the fact that the boat wasn’t bouncing around anymore. This is a bit an idea of what the islet looks like – very low, with white coral sand and a bit of low vegetation and some beach rock. The whole thing doesn’t rise more than a few metres above sea level…something to think about in relation to global climate change. 0850: We have all packed up our field gear for the day and we’re getting into the small boats that the Odyssey carries on her top deck. They’re winched over and placed in the water which means that we can land easily in shallow water with reefs close to the surface. 0930: Disembarked on shore and marvelling at huge number of seabirds nesting in trees and flying around – frigate birds, three species of booby, black noddys and red-tailed tropic birds. We’ve set the satellite connection up and connected the laptop. Now to see if we can Skype to Hutchins… After a few teething issues and a satellite phone to Matt Ralph we establish the connection to my Year 10 Marine Studies class. Initially everything was slow and pixelated but once Hutchins switched off their video, we managed to get a decent connection. Dr. Merrick Ekins of the Queensland Museum showed the class some octocorals that he had just collected (soft corals with eight tentacles per polyp rather than six for hard corals) and answered questions about the equipment he uses – pretty low tech: his eyes and a cheap underwater camera. Then Dr. Andrew Hosie of the West Australian Museum showed some crustaceans that he had found and described the amazing habits of barnacles on coral reefs – since there is not much bare space, they burrow into coral or sponges and set up home there. Finally, I showed the class a brief panorama of the island and we signed off. Amazing how we can be more than 450km from land in the middle of nowhere and yet we can still communicate back to the classroom!! 1100: I put on my snorkelling gear and head off with Merrick and Andrew to do some more collecting. Actually, correction, they’re the ones who do the collecting while I swim around enjoying the crystal-clear waters, the colourful tropical fish and corals and singularly fail to help them discover new species. However, they seem to do quite well without my help! 1300: The crew bring us lunch stuff from the boat – DIY salad wraps and a selection of cold drinks. It’s necessary to keep hydrated since there is constant sun and wind as well as watching out for sunburn. After lunch, I head off with botanists Wendy and John to learn something about the plants on the island. Because we’re so far from anywhere, the only way plants can get here is as seeds floating for a few months or carried by birds. 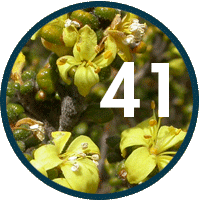 Thus, there are not many species: Wendy and John have found 14 in total on the whole island. Still the birds seem to manage, nesting all over the place – in the small trees but also on the beach and in any sort of vegetation. We have to be very careful not to disturb birds on eggs or incubating chicks. 1700: As it moves towards dark, the crew come and pick up most of us. Five people are staying on the island overnight to collect whatever comes to a small portable light trap that Andreas has set up. Andreas himself is interested in the moths that are attracted to the light, while Ryan and Nik are looking out for other insects and Barbara and Shellie are keeping their eyes peeled for spiders. I’m looking forward to seeing what they find tomorrow! Not much to report today. The whole day was spent rolling and bumping, first inside the Great Barrier Reef and then outside. Passed by a dive boat at about 0900 but other than that, we were totally alone the whole time. Interesting how everyone developed during the day from upright to sitting to finally lying down…most of us were sick at some point, some worse than others. I found that lying down on my bunk was OK but it was a mistake to have a bit of dinner… However, I was a lot better than some – poor old Nic and Barbara. 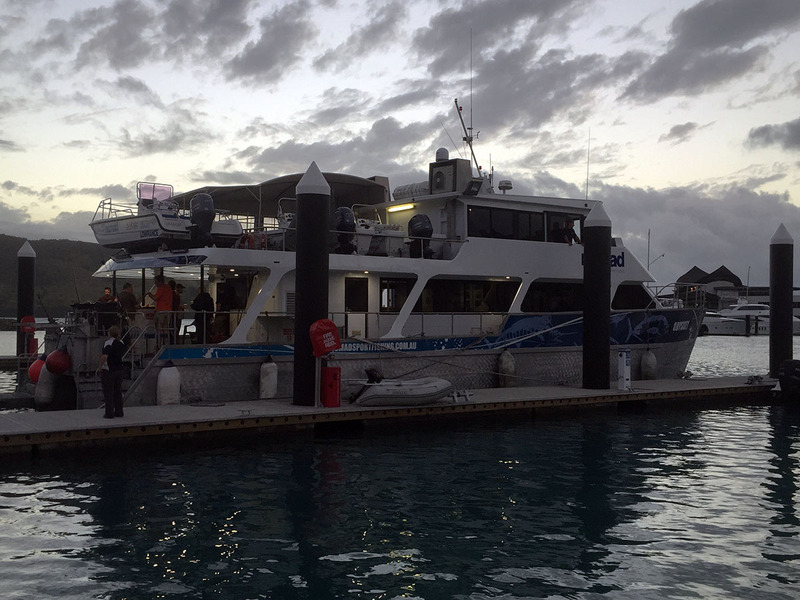 [NEWS FROM THE WEBSITE EDITOR: The Odyssey is scheduled to depart from Hamilton Island for the Coral Sea later today (Wednesday 15th). Conditions are forecast to be fairly rough, and we’re not expecting any more blog entries from Mr Martin-Smith until Friday at the earliest. 0700: Up and about for breakfast. Raining heavily on and off the wind is still blowing strongly. Harry, the cook, has made us all bacon and hash browns. He is an interesting character – he was a roadie with AC/DC and the Rolling Stones amongst others for many years. He was part of the team that brought AC/DC to Hobart in the late 90s and was reminiscing about the sound checks bouncing off Mt. Wellington. We’ve got the morning to do a bit of walking around the island before reconvening for lunch when we’ll here the plan for the departure. Still looking like later today. 1200: Back from walk to Passage Peak – the highest point on HI. Raining up top so not much of a view but interesting forest & a few invertebrates, one of which is going to be the image of the day. Should be easy enough to identify to Phylum and Class but how about Order, Family & Genus – post your guesses on Rory. [See example below for classification of humans]. What is this scary-looking invertebrate? 1800: We have steamed up to Hook Island where we will have dinner and try to get to sleep before we set off at 0300. See you on the other side! 0700: Harry, the cook and steward, made a great mushroom & cheese omelette to start the day. Weather forecast still poor with a high pressure system out to the east sending strong winds and big seas to block our path. 0900: Rather than wasting the day waiting around, we have decided to motor up to Hook Island to test out the various operating procedures we will use out on the Coral Sea cays and islets. We have left the marina and we are heading north for a couple of hours past Whitsunday Island and round to the northern side of Hook Island. 1130: I can see why nobody is keen to head out into the open ocean at the moment. Rounding the tip of Hook we had the swell and wind head on which was quite lumpy. However, we managed to find a bit of shelter around the corner and anchored up. We went through the safety protocols for getting on and off the small tenders that we will use to get to shore and for snorkelling. Just like at school, we need to remain in our buddy pairs, sign when we get in and out of the water and remain in sight of an observer on the boat. Here in the Whitsundays it’s not too far to get medical help but out in the Coral Sea anything serious would require a helicopter and as much as 24 hours to evacuate the person to shore. 1200: The Odyssey carries three tenders that can be deployed using a winch to transport us to shore. We only need one today but we have the capacity to send teams to three different locations. After the safety briefings we all gear up in our snorkelling gear and jump in the water for the first time. The scientists from Queensland and the NT have wetsuits on but I’m prepared to get in with just a rashie and board shorts – it’s 22-23°C and so warmer than it ever gets in Tassie. The visibility on the fringing reef isn’t fantastic but there’s quite a lot of coral reef life to see. Some of the scientists – Merrick & Andrew – are collecting specimens of their study animals, while Gary is taking photographs. The tender takes two of the other scientists – Ryan and Nik – to shore where they are going to look for true bugs (Hemiptera). 1800: Back in port after a bit of a lumpy trip back. The scientists are sorting and labelling their specimens and putting them into ethanol for storage and later identification in the museum. Ryan found some interesting water striders on his trip ashore which he has tentatively identified but will have to wait until he gets back and looks at them under the microscope. Weather is apparently going to get worse before it gets better. We are hoping to do some more local work somewhere sheltered tomorrow morning before setting out in the afternoon/evening. In the meantime we’ve revised the schedule so that we still get to visit all of the important islets. The perils of fieldwork in such a remote location! Headed out to the airport to catch the flight up to Hamilton Island. Still very excited if slightly apprehensive about quite how rough the sea is going to be. Glad that I’ve packed my sea sickness tablets! 1230: Arrived on HI. Managed to find the other scientists whilst waiting for the luggage, primarily because of their large plastic tubs full of equipment, Pelican cases of camera gear and sense of palpable excitement that we were on our way (well sort of). Also met, Shellie, the other teacher on the trip who is from Yarran Secondary College in Victoria. Transferred to the marina to get on board the Odyssey, the boat that will be taking us out into the middle of the Coral Sea. 1500: We have initiated the safety protocols for the boat – a sign-in, sign-out sheet so that someone knows where we are at all times. Not strictly necessary for HI, but good to get into the habit. Wandered to the fish-and-chip shop for a late lunch, but spent a lot of time fending off the wildlife! Cockatoos, rainbow lorikeets, currawongs & ravens all wanted a piece of the fish-and-chip action. 1730: Back on board for a briefing from the voyage leader. Weather still looking rough. 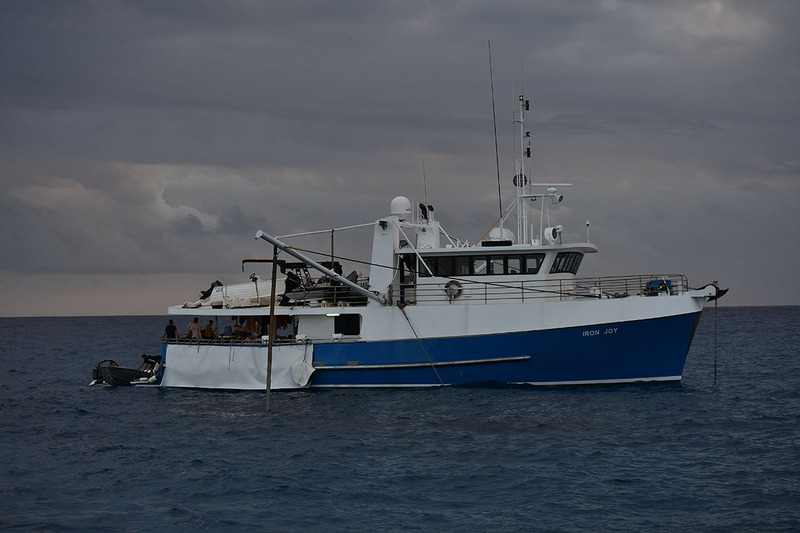 However, good reports from the Iron Joy, the other boat, which left on Saturday from Mackay and managed to get out to Diamond Islets before the weather cranked up. They’ve started collecting plastic waste and there’s quite a lot of it. As for us, we’re just making plans to modify the voyage given that we’re losing 1 or 2 days to the weather. 0800. Excitement building! I have left the chill and snow of Hobart behind and headed off on the first leg of this epic trip to the Coral Sea. I am staying in Brisbane with an old friend before heading off to Hamilton Island tomorrow. 1200. Local fauna and flora a bit different to Hobart – the ‘chickens’ here have not been released by people but are natives, even if they are just as tame. Brush turkey – usually found on the ground, not in a tree! 1400. Just had a phone call from the voyage leader – the weather is not co-operating with our plans! Wind and seas are going to be too strong for us to leave at our scheduled departure time. We are going to assemble at Hamilton Island as planned but we may have to wait around for a while until the conditions are good enough for us to make the run out to Diamond Islets.